It’s the time of year when the days are too short. The weather is a bit too chilly and all I want to do is to cuddle up with a great big cup of something warm and comforting. A spicy cup of chai is my beverage of choice when the urge hits. I’m not talking about the sickly sweet concentrate you get in a carton at the store or your average coffee shop. I’m talking about grounding, nourishing, spicy goodness. This bevy contains no caffeine so you can brew up a cup any time without effecting your sleep or giving you the jitters. The best part is, you likely have most of these spices in your cupboard already. If you don’t, make do with what you have – this recipe is forgiving. 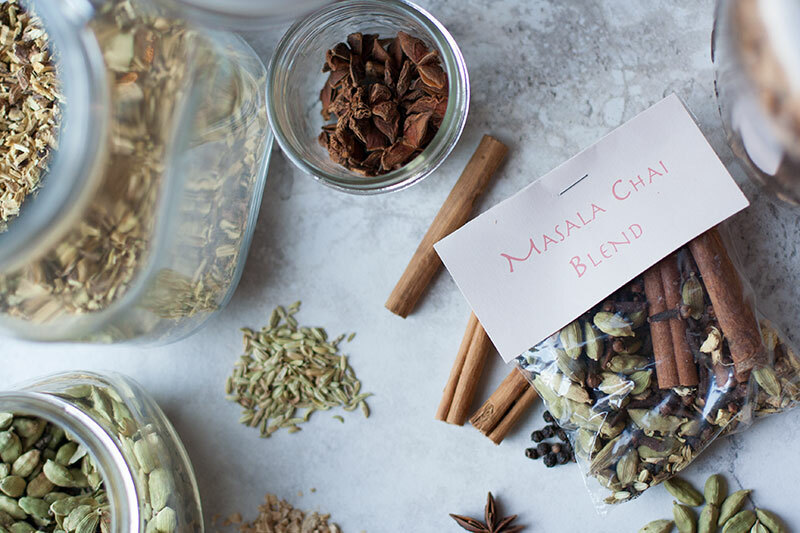 Mix up a batch of these spices and you’ve got yourself a lovely gift. Use little baggies folded over and secured with a homemade label or a pint-sized ball jar for an extra special touch (and reusable container). They can dump the contents into a 3-quart pot, fill with water (about 8 cups) and boil for half an hour. Added bonus – they’ll thank you for making their house smell divine. Cardamom is prized for its wide range of medicinal and culinary uses, which may be why it is referred to as the Queen of Spices. 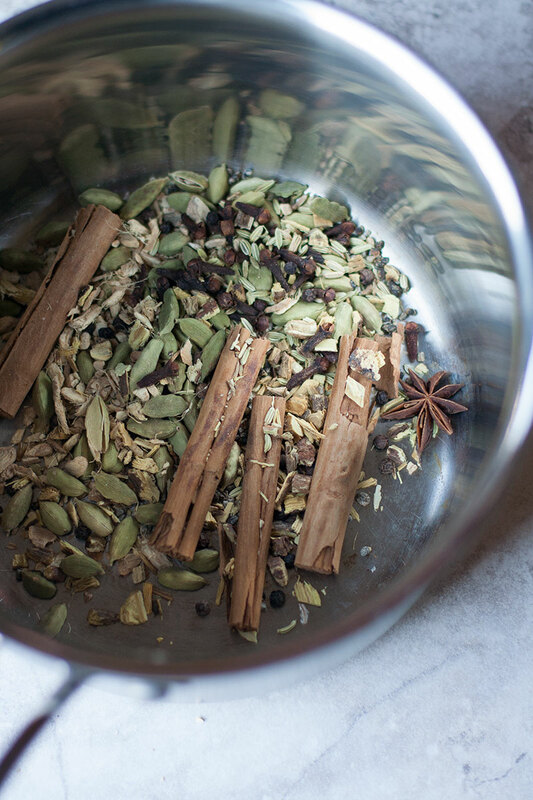 Most notable is cardamom’s ability to soothe and aid digestion. Dozens of studies have shown that the volatile oils in cardamom have anti-inflammatory and anti-spasmodic effects that greatly improve digestion by calming the gut, help expel gas, treat and prevent stomach ulcers, diarrhea, indigestion, constipation and colon cancer. The seeds are often chewed to kill bacteria in the mouth that can cause bad breath. The benefits don’t stop there. In the same way that cardamom helps relax the muscles of the digestive tract it also helps to relax the airways of people with asthma or sinus infections. Cardamom can lower blood pressure and prevent blood clots as well. Is there anything this wonderful spice can’t do? Queen indeed! What I like best about cardamom is the wonderful smell and earthy flavor it imparts to sweet and savory dishes alike. My kitchen is never without a jar of green cardamom pods. 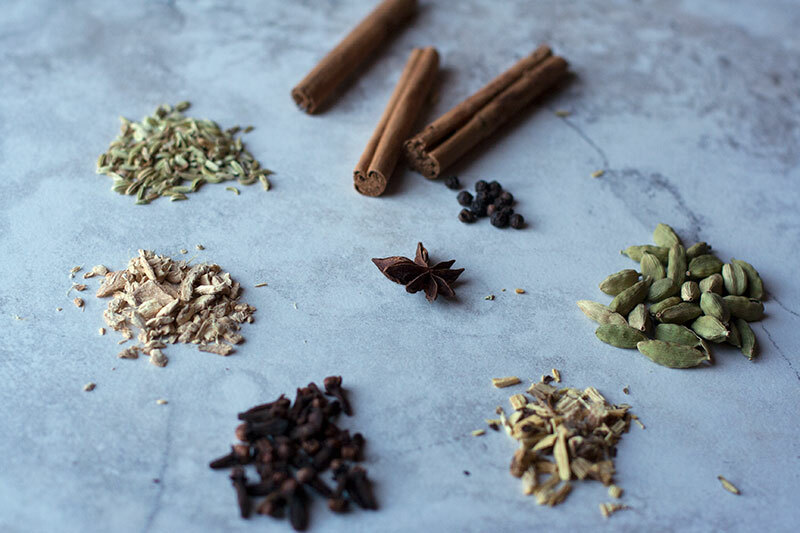 Even though I’ve chosen to highlight cardamom in this post, all of the spices in this recipe are incredibly healing and supportive of the digestive tract. We all know that health and healing start in the gut and this herbal decoction is a top-notch gift for anyone on your list (or to warm yourself on a dark wintry night). Cheers! Place all ingredients in a 3 quart pot and cover with 8 cups fresh water. Bring to a boil. Reduce heat and simmer for 30 minutes or until reduced slightly. 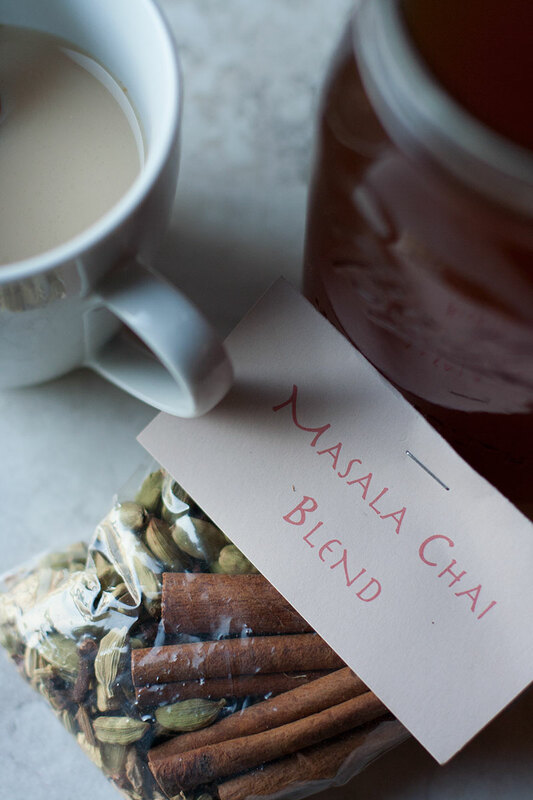 Add 1/4 cup almond milk for each 1-3/4 cup of chai blend plus honey to taste. Store any remaining chai in a jar in the fridge. Reheat the mixture in a small pan before adding milk. Happy Thanksgiving to all of my American friends! And don’t forget – for the next few weeks I’ll be sharing more awesome gift ideas, so stay tuned! Aggarwal, Bharat B. and Yost, Deborah. Healing Spices. New York: Sterling Publishing, 2011, P62, Print. Oh my goodness this sounds awesome! Thanks Grace. So yummy on a cold winter night. Ah, so it was you huh? Actually it seemed pretty popular all around – I’m glad you enjoyed it!